It’s time to furnish your workspace but where to start? Talk with our furniture consultant or your designer, our team has a variety of experience helping business owners and general consumers identify and locate the right product to fill their office furniture needs. For some, planning to furnish or refurnish an office space can seem daunting and there’s so much to consider. What do I need, what do I want, and how much will it take to do all of this? Buying new may seem like the best way to go, but maybe not, there are advantages to buying pre-owned office furniture. Oh, if you didn’t know, we sell new and pre-owned so you have the best of both worlds, so you can focus on style and budget. 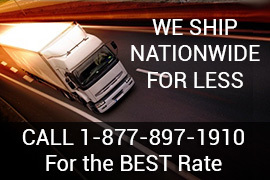 We purchase from a variety of quality companies and we have the resources to purchase the finest available since we have a 30+ year reputation in the furniture industry. What we acquire is not randomly selected; our buyers scrutinize for quality, brand and condition before considering items and then, each item is individually evaluated when brought into our main warehouse in Phoenix, AZ. The budget is almost always the first consideration for both new start up and established businesses. Companies run against the profit margin, so it’s not surprising they want to save wherever possible. Purchasing gently used or refurbished furniture can be an excellent choice when it comes to meeting the bottom line. Compare the pricing of a high quality ergonomic task chair that sells for $800.00 like a Steelcase Leap. The same task chair when purchased at National Office Interiors and Liquidators can save you around $400.00 because it’s pre-owned (and we provide a warranty). When you spread that savings across furnishing an office or entire company, than it can really add up. 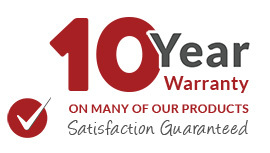 Who doesn’t love getting a great deal and a warranty? Office furniture can be stylish, and come in a variety of colors – black being the most popular of course for chairs and gray for cubicles. Sometimes business owners and designers worry they will have to give up unique style or their decor when they elect to purchase pre-owned furnishings, but that is simply not true. Used furniture does not have to mean old and tired. 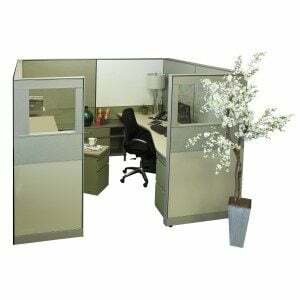 Our selection is wide, we have cubicles, desks, tables, chairs, and storage in many configurations, colors and patterns. If the upholstery is not the color or material you like, there is no reason to shy away either. You can easily modify your fabric selections by having them reupholstered to your taste – we can help you with fabric selection and upholstery or you can work with your interior designer. If you love a desk configuration, but not the color, we can have it stained – the choice is yours. We’re green, so when you purchase from us you can be too! Your business’s purchasing carbon footprint is reduced when you buy gently pre-owned merchandise, you’re keeping quality furnishings from being disposed of unnecessarily. It’s always beneficial to go green. 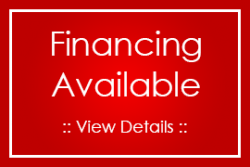 There is always a wide selection of styles from modern to traditional in the pre-owned market. You can choose from all kinds of finishes, like laminate, natural wood, plastics, and veneers. There is an assortment of designs to choose from as well. Whether you have an eclectic style or like things very sparse with clean lines, there are selections that will fit your needs. Looking for the hottest brands and styles for a fraction of the list price? 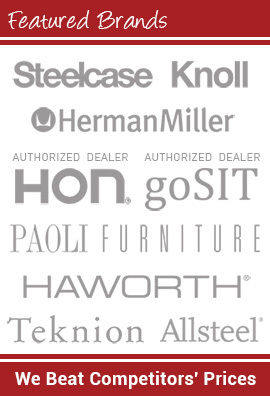 Then you’ll love our most popular brands like Steelcase, Haworth, Knoll, Hon, Global and Herman Miller. 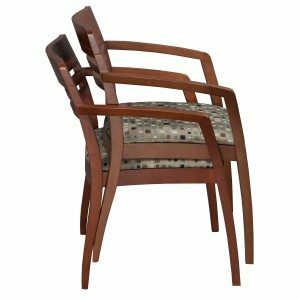 We also bring in high end, artistic, quirky, and retro brands like Cabot Wrenn, Davis Wolfgang, Humanscale, Hancock and Moore, Hag, Keilhauer, Kimball, Teknion, and Brueton. We liquidate product (aka treasure) on a regular basis; we love it when we see a semi-truck pull up because that means new pre-owned items are here. Check back regularly, we always have something new to offer, but remember once it’s gone we may not have the opportunity to liquidate it again, so please buy it when you see it because it could be sold out tomorrow.